Welcome to BJ's Restaurant & Brewhouse! The place to go when you're craving amazing handcrafted beer, delicious pizza, flavorful entrees, our famous Pizookie® desserts and good times. 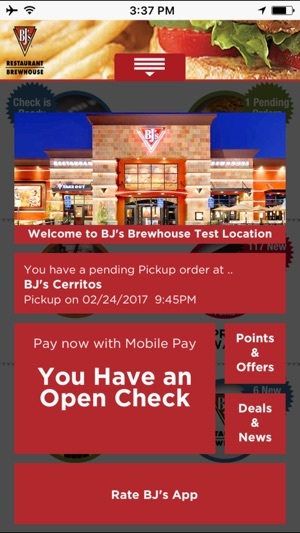 • Easily locate the BJ’s Restaurant & Brewhouse closest to you. • Find out what’s new and get special offers. • Dine-In Order Ahead! Place your order in advance to dine in. We’ll get your food and drinks started while you’re being seated. • Get on the list! You can put your name on the Preferred Waitlist to save time. • Order take out! 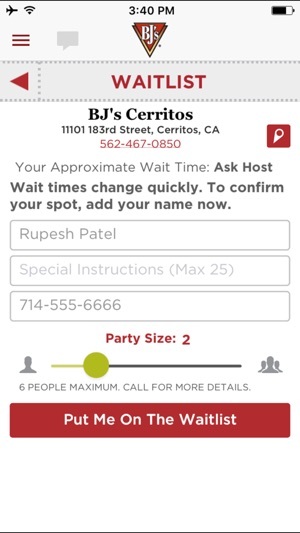 Place your order in advance right from the app and pick up inside. In some locations, we’ll even bring it out to you with our curbside service. 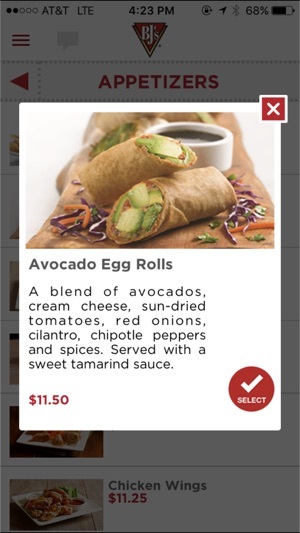 • Mobile Pay: You have the power to view your check and pay right from the app using Apple Pay, PayPal, and more. 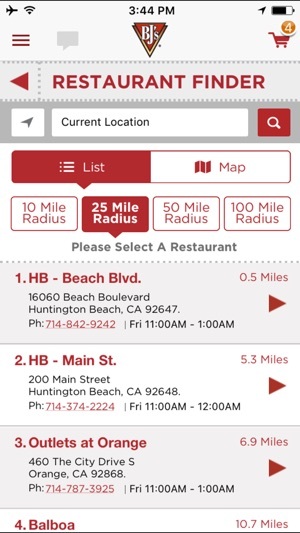 • Group Ordering: Organize lunch with your friends right from the app and don't worry about figuring out how to split the bill or pay for individual items. Our app gives you the tools to make it easy. 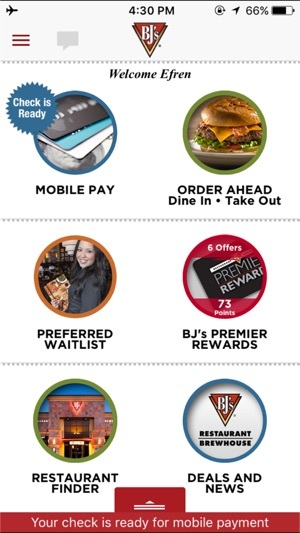 • Get rewarded: Join BJ’s Premier Rewards to get rewarded for every visit (learn more about BJ’s Premier Rewards at www.bjspremierrewards.com). Actually, if zero star rating was an option, this would be a “no star” rate. I placed a take order. I arrived at the restaurant and my order was ready. However, the server did not have the ticket and said her manager, Kim would have to assist and check me out as “Kim has the checkout stub.” Literally, I had to wait 30 minutes before I could pay for my order, and this was not without my asking if someone else could f/u w the manager, and/or if someone else could assist instead. The worst thing is, the manager Kim never showed up to check my order out. Three of her staff said their manager Kim “was in the bathroom.” The whole 30 minutes? I asked again if someone else could help check me out, and one of the other workers stepped up and finally figured out how to check me out so I could pay for my order and leave the restaurant. Needless to say, the food was cold when I finally made it home. I told my husband I will never order from the Del Amo BJ Restaurant again, and I won’t take any of my friends or family members to this restaurant. I will further tell my family never to give me $$$$$ gift cards for BJs. For a long time restaurant lover of BJs who won’t go back to BJs Restaurant, this should give you an idea of how bad the manager treated her customer- me (I should add the manager never showed her face to apologize even). Though this was the worst experience w BJs, I feel really bad for those servers under her management! We had a terrible experience tonight. We have been about 5 times since the Warwick location opened and have loved it so far, but tonight really changed that for us. Our waiter was terrible and took over 10 minutes to come by and acknowledge we were there and take our drink order. My husband had the broccoli soup bread bowl with boneless wings and apparently the bread bowl dropped on the ground before coming out, so they had to make another which took over 20 minutes to come out and we were done with our meals by then. It wasn't even the time, it was that the waiter never addressed the wait until right before it came out and was extremely slow and could have cared less that we had already finished our meals by the time the soup came out. We were also charged for all of our soda refills. On our other visits we had never been charged for refills on soda so that was very confusing? Are there only free refills on certain nights? Very disappointed and saddened bc we really thought we found a new place that would always be decent. © 2016 BJ's Restaurants Inc.